Academics in the humanities who look to make a career change often think of publishing as a great go-to job. I spent a brief time in publishing after I left. While there are some pretty good publishers and agents out there, the work that’s available is awfully similar to what academics are trying to get away from. A while back, Eliza Woolf at On the Fence described her realizations as she started interviewing for publishing jobs. For starters, the wages are not good, less than what you’d make as a first-year prof. It’s more than what you’d be making as a TA or an adjunct, but if you have any sort of debt, you’re not going to be able to pay it off with an entry-level publishing gig. You also have to do a lot of grunt work if you ever want to make it big, and the number of jobs at the top is shrinking. The biggest issue for me regarding publishing is that it isn’t as forward-looking as it could be … and that should sound familiar to anyone who wants out of the academy. E-Readers have shaken up publishing, and a few authors (good, published ones) are declaring their independence from print. Read JA Konrath’s A Newbie’s Guide to Publishing to get an idea of where the future is headed. Also read it to get an idea of how slow some parts of the industry have been to keep up. More after the jump! 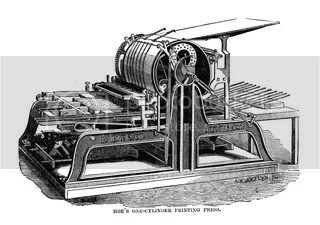 Image of Richard March Hoe’s printing press by A.H. Jocelyn from Wikimedia Commons, public domain. That said, if you enjoy editing and writing, you can still do it beyond publishing and journalism, and you can get paid better for it if you are willing to learn something new. Companies of all kinds have a need for writers and editors. Some of the best jobs I’ve had delivered tech and financial content. I could apply my writing and editing skills while building new ones. So, as you start casting your resume upon the waters, don’t assume that traditional publishing must be your go-to job. There’s nothing wrong with going into publishing, and I’d try my hand at it if it were a better fit for my skills. But, if you really want to break ties with the past, aim for editorial jobs beyond the publishing industry. Subscribe to comments with RSS	or TrackBack to 'Publishing Jobs Outside the Publishing Industry'. Thanks…I’ve heard all of the things you describe and it made me think twice about publishing as an alternative career. I wonder about the market for digital publishing? There must be some opportunity there. I recently did an interview with a former Amazon.com Music Editor and answered a bunch of questions from readers about publishing (such as is it hard to get jobs, the pay).